Imagine a future where drones have been perfected and they are seen around the clock buzzing around the busy city skies performing mostly maintenance but also assisting law enforcement. Drones can be used to monitor for crime, identify wanted suspects, and just patrol the streets in general from a live bird's eyes perspective. 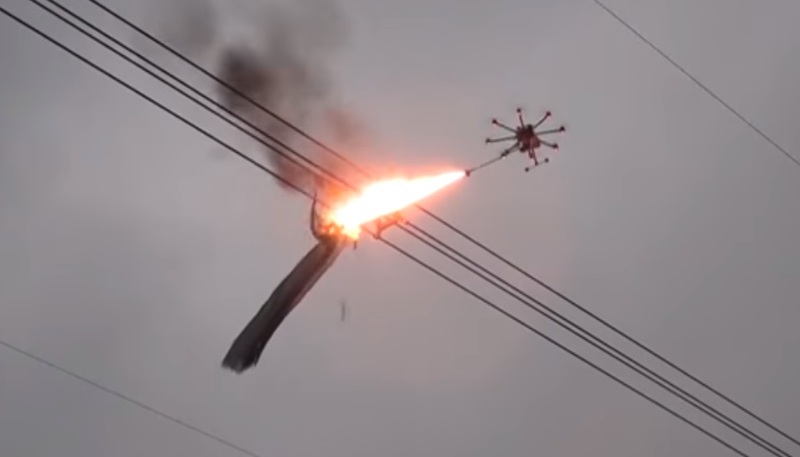 For now, those pushing the boundaries of what a drone fundamentally is are hard at work designing drones such as this one which uses a flamethrower to clear debris off power lines. Clearing debris from dangerous power lines is just one creative example of what lies in store for the future. A fleet of police drones hover throughout cities and report a violent crime in progress or be the first responder to the scene of a fire and use water jets to extinguish it. Researchers in Japan are working on a drone that can do just that, it's called the Dragon Firefighter. Maybe a drone could even go into a burning building with a small, glowing rope hanging from it. Why the glowing rope? Well, a drone could enter a building that is pitch black from the smoke and locate survivors with thermal vision. Then the survivor could grab the rope and let the drone guide them to safety. I think in the future, specialized drones become a common sight in daily life. I just wouldn't expect to get a haircut from a drone anytime soon! Someone played Halo2 and liked the sentinels, I see. Already seen homemade assassination drone videos. Firing small caliber 20+ rd firearms with remote video firing sights. In fact ATF already has issued a reg about remote flying fire-able firearms. The Police need to get a large one fitted with a gallon of Tear Gas/ 4 day dye for looters and rioters.